The literal crunch of Washington-area traffic left Michael Seth without a functioning car, so he was unable to lead the scheduled Whetstone Ridge hike. John Shannon rustled through the archives and proposed the Hazel River hike, which we had not walked for 3 or 4 years. With years to forget the details, and fact sheets left at home, information about the hike was sketchy, but everyone knew that they faced an all uphill afternoon. Although the calendar said spring, the low temperatures suggested otherwise, and a gale at Thornton Gap felt like winter. However, the long lines at the entrance station and restrooms, plus a full parking lot, indicated that other outdoor enthusiasts thought it was spring. Soon after starting the hike, we dropped into areas sheltered from the cold, westerly wind and enjoyed the pleasant temperatures and descent. At one of the trail junctions, John recalled how some years earlier, when the group departed before he arrived, he saw broccoli on the ground and declared, “Leon Gorman was here;” immediately knowing which trail to take. Most people today chose to make the steep descent to the waterfalls and miniature cave by the Hazel River. 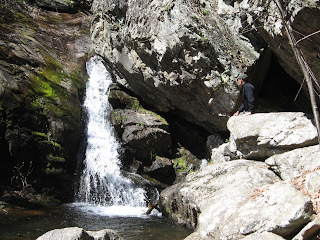 We found the scenery was worth the effort but then faced the steep ascent back to the trail. After another steep descent to the Hazel River and crossing it, we stopped for lunch. Then the ascent started, and people spread out, with coats coming off and water bottles coming out. When Maynard Davis and John Shannon cut part of a tree across the trail, the other hikers enjoyed a little break. Shortly thereafter, we encountered a group we had seen earlier. The group included a pit bull, whose humans professed: “He’s friendly.” The dog proceeded to growl at three of us. The dog was not on a leash as required by the Park Service, which has listed the deleterious effects of dogs wandering freely in the park. We later warned some others heading down with dogs that they would encounter an unleashed pit bull. Andy Willgruber and his lucky passengers (John Brandt, Marian Styles, and Dan Funkhouser) stopped at the Little Country Store in Etlan for ice cream and barbecued chicken. Others on the hike included Dave Borszich, Rita Keiffer, Joanne Davis, Lindsay Brown, Eric Christenson, and Barbara Wilson. 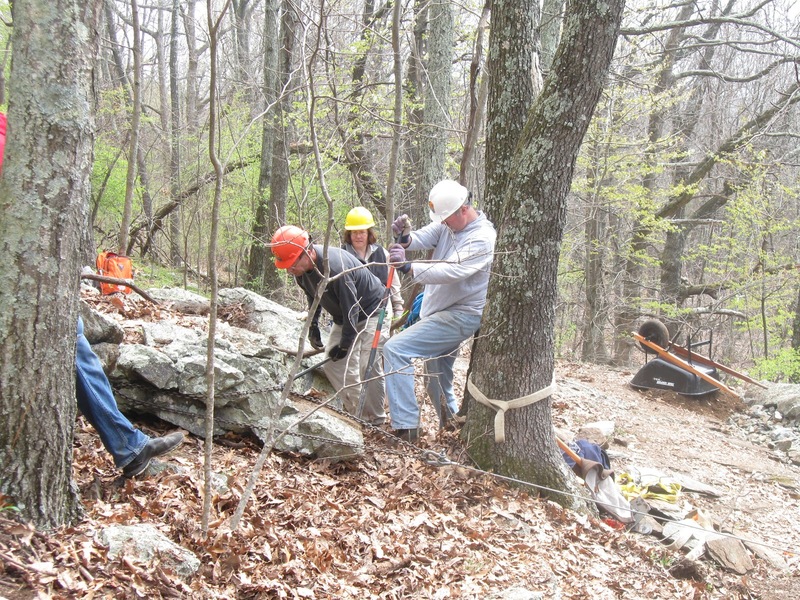 This weekend was a continuation of the Appalachian Trail relocation at Calf Mountain which started last September. The website www.southshenandoah.net/ describes the relocation as removing the AT from a steep ascent to the saddle below Little Calf and bringing hikers onto better grades and more diverse backcountry scenery. Saturday started with a cold wind as we waited for workers to arrive. 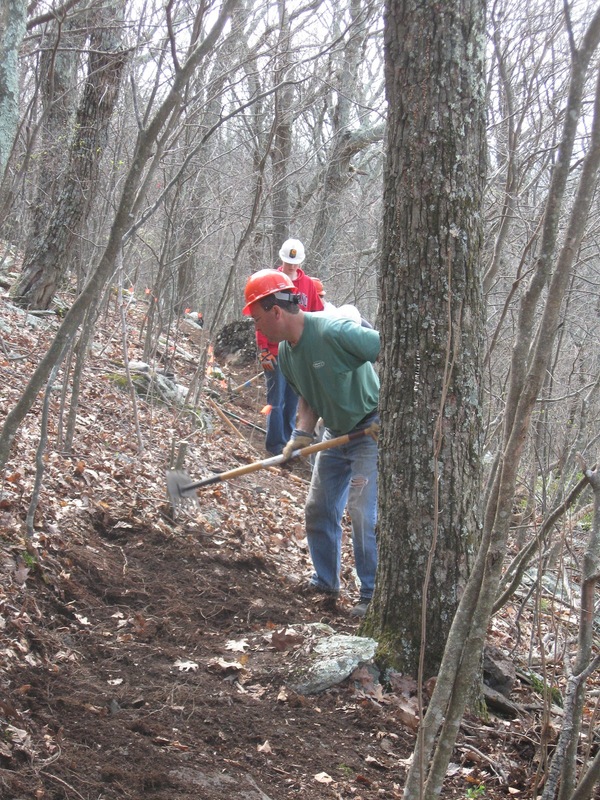 Charlottesville Chapter volunteers included Andy Willgruber, Lindsay Brown, Connie Wright, and John Shannon; some other chapter members worked on other trails that day. 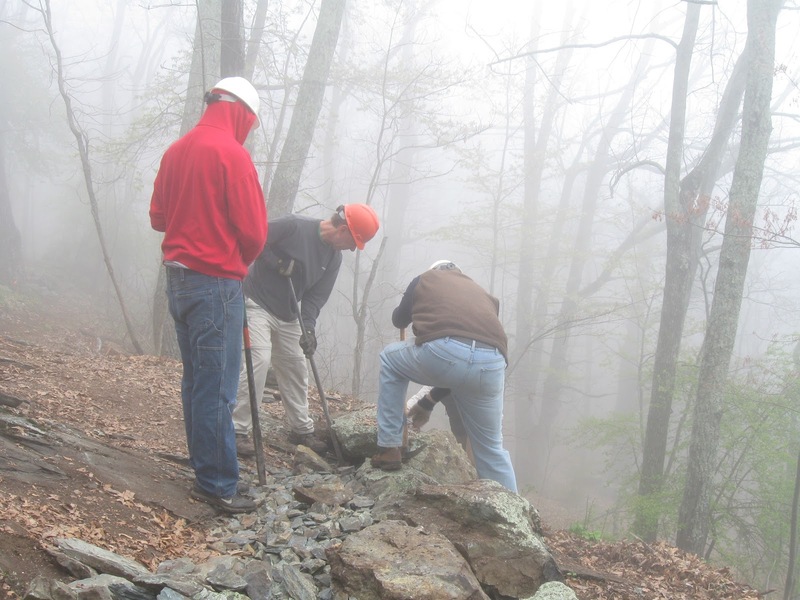 ﻿﻿﻿﻿AT District Manager Don White assigned some people to a group that started some rock crib work to route the trail around a rocky outcropping that would be slippery when wet. 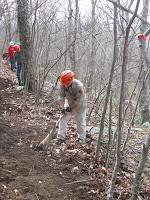 Patrick Wilson, trail maintainer extraordinaire, headed that group (one of the many trail maintenance specialties he is a master of). 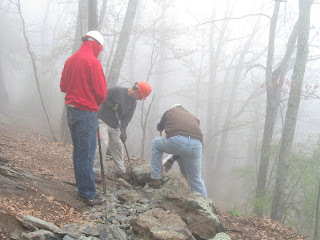 This group used a grip hoist to move large rocks to make a wall, and then started filling the space behind it with small rocks as well as pieces of large rocks broken by hammer. 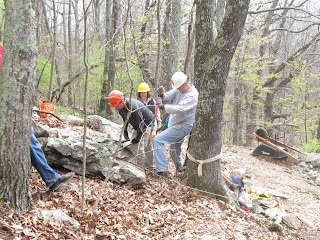 On Sunday, with PATC Supervisor of Trails Catherine Kelleher in charge, the work continued and provided an educational moment for some of us: watching the crew move a large rock with the grip hoist. 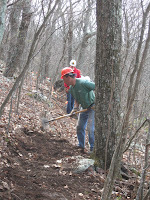 ﻿﻿﻿Most other people built new side hill trail, which is not as steep as the AT section we are replacing. 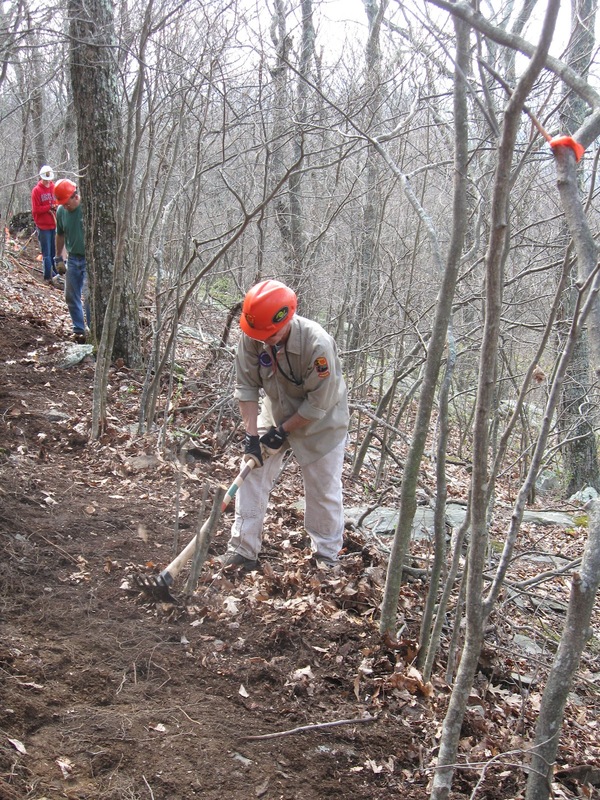 The goal is to build the trail to slope out so that water can run off the trail instead of down the trail, which will reduce erosion. Mark Gatewood, crew leader for the Flying McLeods, guided that group and demonstrated a new tool for tread work. The section we built this weekend is situated where its construction was more difficult than normal. Building a flat trail surface of solid earth is difficult when you are working in an area of rocks embedded in a mass of fine roots. Nevertheless, we built a good length of trail, and at Saturday’s end, we left tools nearby for those returning on Sunday. Sunday started with fog. Suspecting others were sleeping off a large dinner prepared by Mary Jorgensen of Dunlodge fame at Schairer Trail Center where most of the crew stayed, John Shannon headed up to the trail construction site, but after a period of moving rocks and trying to find trail construction earth, he thought it was time for the others to appear. Heading down the trail, he met a couple of people going to collect tools. The tread work for the day, besides assisting with the crib work, was to correct the out slope of some trail built last year, where settling of earth resulted in some suboptimal slope. Toward the end of the day, PATC president John Hedrick came to see the state of the work and also the area of a possible relocation on Bear Den Mountain. For those who wonder, two days of trail work did not leave us physically exhausted. We do not get dollars for digging, and the crew chief does not walk around saying, "Work harder." He does say, "Stop, take a break" and encourages people to work at a comfortable pace, so people feel comfortable stopping for a minute if they want to.